HIGH QUALITY GLASS! MAXIMUM TRANSMISSION. 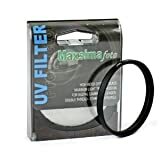 Protects your lens front element as well as stopping UV rays. Standard Profile with double thread.